The sun has returned and for a change the weekend forecast is one without snow…rain…a lot of wind…hail…storms…and about 20 other things…nope this weekend, while not perfect…will at least be a bt more tolerable..especially Saturday. Sunday will be a few degrees cooler but still OK for mid-March. There are no big storms coming for awhile it appears so things are starting to settle down for a bit of time…maybe not perfectly rain free next week but still a lot better overall. We’ll need the drier weather. Spring starts in about 5 more days…Wednesday at around 5PM or so…and as is usual flooding is typically an issue in this part of the country, especially along the rivers of MO. Flooding though is a complicated thing…sometimes the floods are not so much related to the actual rain/snow that happened locally but more affected by what happens across the MO River Basin towards the northern Plains. The waters that drain through the MO River that runs through KC actually start all the way up into Montana. The end of this River…is the Mississippi River in St Louis where the two merge and eventually everything flows down the MS River into the Gulf of Mexico. So when one looks at flooding potential (in the big picture) it’s important to see what’s happening in the Basin as a whole and to watch what’s been going on for awhile. So let’s start there. 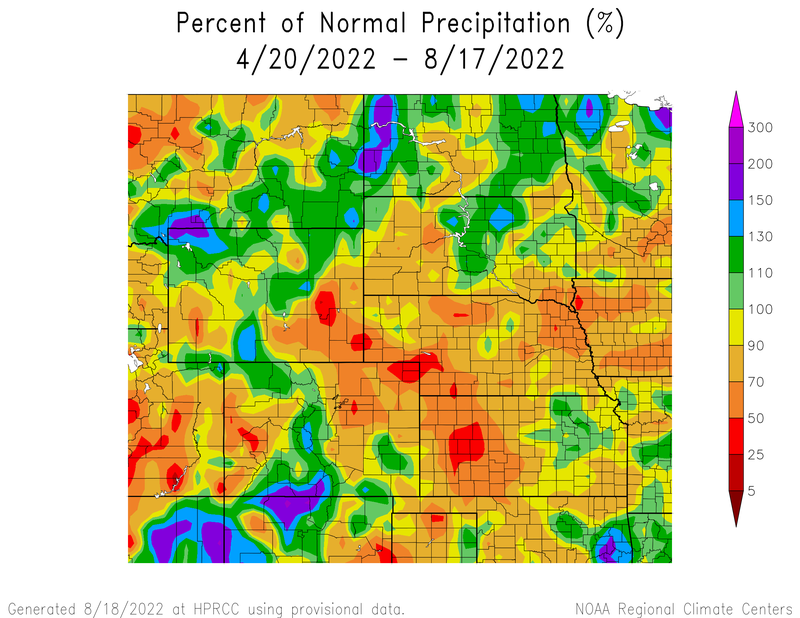 Let’s take a look at the last 4 months of moisture across the upper Midwest…compared to average. Note the scale on the right side…the purple colors are 150%-300%+ of average…in other words…on the high side…3 times the average amounts of moisture…rain and melted snow. So obviously there is a ton of moisture in the soils already. There are other issues…that same soil is moistly frozen…why…because it’s been so cold up there without any thaws of significance for awhile. Look at how temperatures have trended over same four months. Greens are cooler than average but the lighter blues>purples are really colder than average. That means that the ground is frozen…so whatever falls (if it’s rain) just runs off…why…because the ground is frozen. Not a little frozen…it’s deeply frozen. Note the green markers in IA…that means the ground is almost 2 FEET frozen thick…and it’s frozen even farther down across the upper Plains. So even when there is a thaw…the top few inches may thaw BUT the ground below that is still frozen and can’t soak in any moisture…so more runoff. The snow has been plentiful up there as well. Maybe not crazy totals but certainly enough. That leads to a couple of things…one is still LOT of snow on the ground heading towards the Spring thaw that’s coming. and 2…all the moisture IN the snow that is waiting to melt and then runoff into the streams>rivers and send the water levels even higher. That’s 5-10+ of moisture just waiting to melt off and run off…and go into the river systems up there…and yes…it has to drain down towards us at some point. Another issue is at least over the next 10 days…warmer than average temperatures are likely. That’s good and bad up there because that means things are going to melt off a bit faster. Plus we’re coming into Spring anyway…so seasonably mild weather is melting off the snow. That is holding back water BUT it’s also a release valve…it’s up along the border of SD/NE…near Yankton, SD. 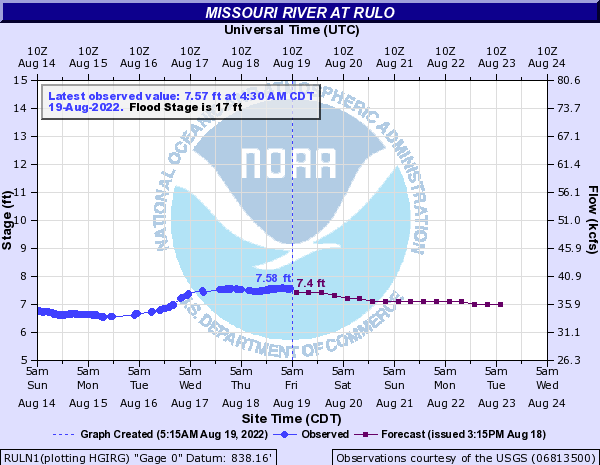 That damn…in an effort to reduce flooding on the MO River towards the west…will release water. The releases send more water down the MO River towards SE SD…and in time down the basin towards the KC region. As of last night…the waters being released had increased to the rate of 90,000 cubic feet per second. This morning it’s up to 100,000 cf/s. 12 of the 14 spillways are being utilized for the release…the other two I believe have ice jam issues. So what does 100,000 cf/sec mean? Let’s try and make this somewhat more palpable to us…and convert that to gallons per minute. Each 1 cf/sec equals almost 7.5 gallons per second. That’s more than 748,000 gallons per second. Almost 45 million gallons per minute and almost 2.7 BILLION gallons per hour. That’s a LOT of water…all draining into the MO River in addition to all the other drainage happening. The areas that are being watched for the the next week are towards NW MO…where the water levels will be higher initially. 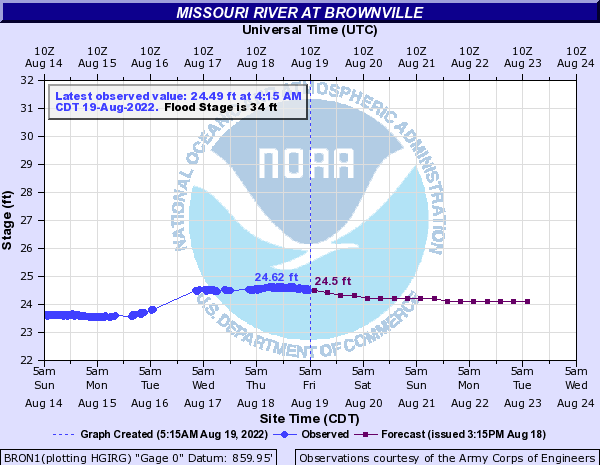 The purple dot in the NW time of MO is the MO River at Brownsville, NE. The record is around 44.8 feet. Note that this is forecast to be almost 3 FEET above the record set, not in 1993…but in June of 2011. 44 Water nears the top of the federal levees on both sides of the river. 43 A portion of the federal levee along the Missouri side will be near overtopping. If overtopped this flooding will impact a significant portion of Interstate 29 and Highway 136. 40 A hiking trail along the river on the Nebraska side is likely flooded. 38.5 The access road to the power plant begins flooding, also portions of 648A Avenue flood near Brownville. 35 The parking lot and boat ramp south of Highway 136 on the Nebraska side are underwater. 33 Agricultural lowlands along the river begin to flood. It is forecast to be within 6″ of it’s record…set in 2011. It’s impacts. 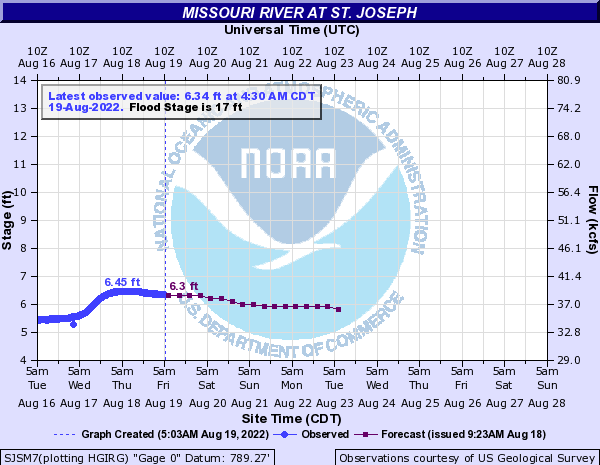 Now farther downstream towards the MO River in St Joseph. This forecast is below the record set in 1993 and then almost replicated in 2011. It would be the 3rd highest level on record. Now remember, and this is important…IF there are bigger releases up towards Gavins Point…there could be increased water levels down the road…and at this point while no significant moisture is expected for the next week…IF that changes that too can affect the values above. So flooding is going to be an issue…not only over the weekend but for an extended period. Back in 2011…there were big issues for I-29 with water levels that high…the same thing can occur over the weekend across NW MO. MO DOT shows the flooding affecting the roads. 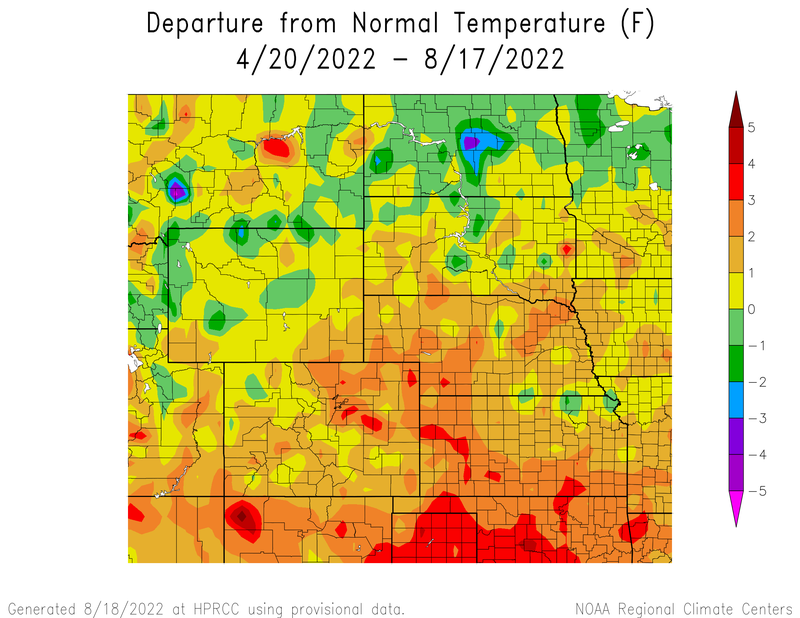 Nebraska is a mess and getting worse…especially north and west of Omaha. and western IA is getting messier too. At this point I-29 is open all the way up towards Omaha. We’ll see if that stays the case over the weekend or not. Some of those same MO River levels that are forecast over the weekend occurred in 2011 and closed I-29 up towards NW MO. Our feature photo is from Mary Jo Seever up in Atchison, KS…she’s watching the river too and it’s getting higher.